I’ve got a lot of random thoughts flying around my head lately. I’m struggling with time management. I have so much to fit into a few hours each day. I have yet to walk into work and accomplish exactly what I set out to accomplish. But that’s another post! I have about four hours every night to do a lot of things. Maximus has decided that regardless of the last time he ate, when he sees me each night he’s ready to eat. I think it’s pretty obvious that I would be a comfort zone of his. He spent the first three months attached to me more than he wasn’t. That might be a slight exaggeration, but not much more than that. I always envisioned our routine once I went back to work. It looked like this: nurse him before work, after I got home, and before bed. I never wanted to get into the habit of nursing him to sleep, but I assumed he’d nurse before he went to bed. Well, as he proved on the day of his birth, he had different plans. Most mornings we wake him up at 6:30 so I can nurse him before I take him to daycare. In the past three months, that routine has stuck. In the beginning, I’d have to guess when his afternoon bottle would be. Eventually we both moved to the same schedule, him taking two bottles and me pumping twice during the day. What has wavered is his bedtime nursing sessions. In the beginning I made sure he nursed before we put him down. After about a week he showed us he wanted to be in bed by 8:30, at the latest. I considered myself lucky (because I’m the one who has to pump) if he had a full nursing session. More often than not, he’d get half in and fall asleep. He’d wake up when we put him to bed, but quickly fall asleep again. Eventually we cut out that final feeding all together. He gets fussy and starts rubbing his head and searching for his thumb. We take the hint and put him in his crib. He sleeps unswaddled, per his request, and is asleep within 10 minutes. On a good night, this is 8 pm. Other nights it’s all we can do to keep him awake past 7 pm. My kid, he likes to sleep! Back to my focus – a lot to do, little time. Come home to 1) sleeping baby, 2) laughing baby, or 3) crying baby. Depending on the number, I either change my clothes or feed the baby. Next I figure out what to make for supper (because I can’t get motivated to do it ahead of time). We eat. We clean up. Maximus has a bath or goes straight to bed. I do my Internet thing and wish I had the motivation to do some blogging. Then I watch a little tv and think about how awesome it would be to go to bed at 9 pm. While night-after-night passes me by. I wish I was redoing my blog header, redoing my blog design, creating a Project 365 button, sitting down and doing my Project 365 on the computer each night instead of using my phone, updating my Shutterfly pictures so family can stay up-to-date, updating my Facebook albums, finding picture frames for the family pictures we had taken, doing some more research on cloth diapers (and making a decision to do it or stop thinking about it), reading the stack of books (marketing, parenting, vaccines, and fun) that are sitting around the house, and play with my camera more. Like I said, there’s a lot going on in my head at any given moment. When the end of the day hits me, it’s all I can do to find the motivation to let the dog out or wash my face. The next thing I know, I’m hitting snooze on my alarm, again. And now, the stuff you came for…a cute picture! A story that fits this cute little smile. Ok, it’s an extremely large smile for a cute little baby. You know what I meant. The other morning, I was coming back from the laundry room and thought I’d creep on Maximus and watch him sleep. It was a little after 6 am and I still needed to get dressed, do my hair, and put on my make-up. We wouldn’t get Maximus up for another 30 minutes. When I stuck my head in his door, I saw eye balls shoot up to look at me. I froze. I wondered if he was really looking at me. When I saw this same smile, I knew I’d been spotted! I stood there a second longer before I said good morning to him and decided that we’d change-up our morning routine. I turned on the light and he blinked away the bright and gave me this face a few more times. In between the face, he stretched and kicked. I may not be a morning person, but it’s pretty easy to get out of bed when you have a cute face like this greeting you! I hope his excitement for mornings continues. I don’t want to wrestle a crabby toddler in the early morning hours! 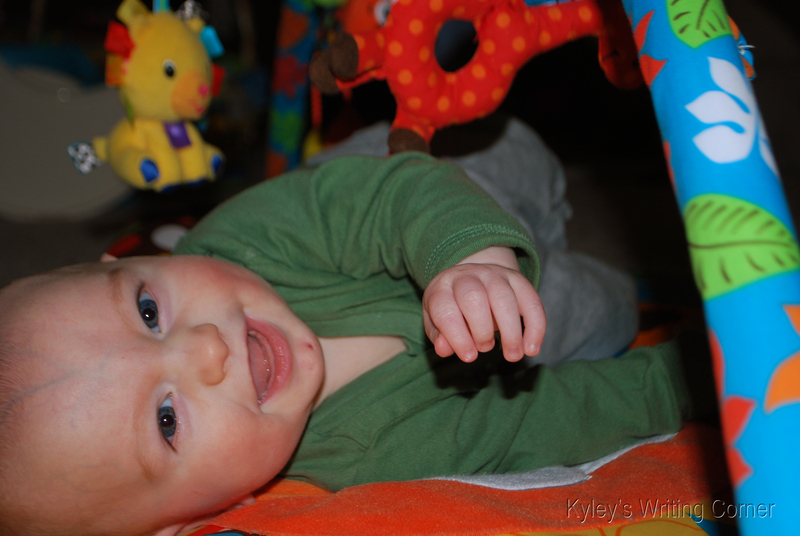 This entry was posted in Baby, Careers, Life, Maximus, Parenthood and tagged Project 365 by Kyley Leger. Bookmark the permalink.